Christian music artist, David Phelps, approached us about redesigning his website. In addition to providing timely information for his fans about upcoming show dates, news and new music, he needed a place to help promote upcoming multi-artist performances at his live music venue in Culleoka, TN. David is a super talented music artist with music ranging from Classical to Christian. It was extremely fun to work with him and his team, and we are proud of the site we produced together. David’s homepage is a quick reference and overview for the site. Including a hero video, followed by navigation and calls to action for his barn bash events, recent news, social media posts, and upcoming events the site homepage collects the latest content from each section of the site. The blog offers a masonry grid of recent news with a short blurb and featured image. Using a variety of ticket sales sources for an ever-growing list of shows, we created a CMS managed events list for the artist with CTAs driving visitors directly to ticket sales on the various platforms. 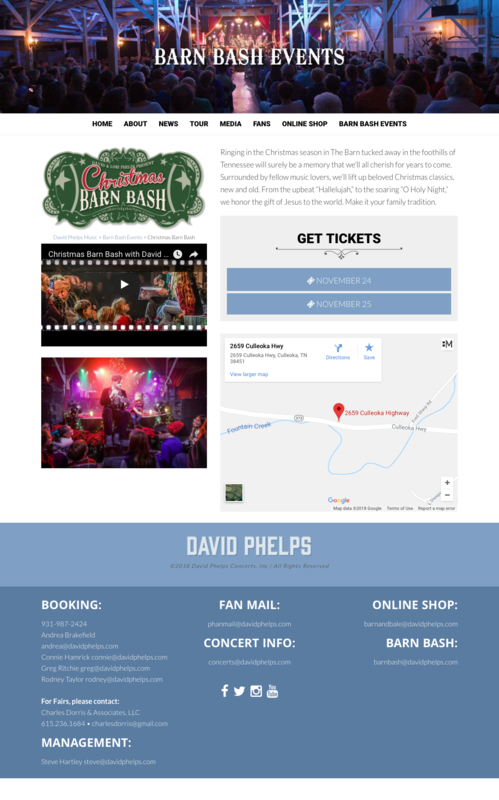 David holds several special Barn Bash events at his farm in Culleoka, TN. Featuring various music artists, he needed a place to promote each event and provide ticket sales information with his iTickets integration.